Back in the 90s, 1997 to be exact, the term “weblog” was coined. Having your thoughts distributed for the world to see was as commonplace as the denim jacket. However, it wasn’t until later that blog content became a catalyst for business traffic growth. But now, we’re surrounded by content marketing tools such as video and GIFs and never-ending social media streams that tend to take up most of our time. Even as we implement these tools into our content marketing strategy, however, we shouldn’t forget about our blogs. For true content success, a blog is required. Marketers who prioritize their blogging efforts are 13 times more likely to see a positive ROI. 60% of consumers feel engaged and positive about a brand or company after reading custom content on their blog. 47% of business to business buyers read 3-5 blog posts or content pieces prior to talking to a salesperson. It’s safe to say that regardless of what new-and-improved marketing method we have available to us, blogging is here to stay. 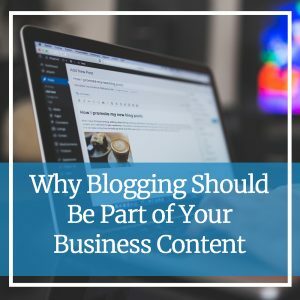 So, Should You Blog for Business? Heck, Yes! Here’s Why. The benefits of blogging for business abound! Here are five of our favorites. 1. A Blog Builds Trust and Confidence. For service-based businesses, blogs show authority. They showcase your knowledge and know-how on what you offer and set you apart from the competition. When a consumer believes that you “know your stuff,” they’re more likely to give you a call. 2. Blogs Are a Source of Information. Your blog is the source of in-depth information that your audience is looking for. Long-form blog content provides consumers with a wealth of information about the topics they crave, further enhancing your reputation. Plus, your blog gives you the chance to showcase even more information about your business and your services, without overloading your website. A whopping 75% of consumers don’t scroll past the first page in Google. Internet traffic requires a good search engine ranking. A good search engine ranking requires good SEO. And good SEO requires quality content—words! You can bulk up the number of words on your website, even if you’re a small business, by blogging on a consistent basis. When writing, remember that keywords and high-quality information make all the difference in your traffic. 4. Blogs Start a Conversation. Although social media is a great way to start conversations with your customers, a blog invites them to comment, share and subscribe for more great content from you. Not only does it build your email list, but it’s also a basic communication tool that works. 5. Blogging Generates More Content. Sure, you can do social media without a blog. However, blogging makes creating content for your social media and other content marketing efforts simpler. One blog post can be transformed into many social media blurbs, lead magnets, images and more without extra brainstorming. Need Help With Your Business Blog? We’ve Got You Covered! If the benefits of blogging that we shared above don’t convince you to breathe new life into your stale blog or to start that blog you’ve been thinking about for a while now, then reach out to us. We can talk you through how a blog might fit in your business’s content strategy. Or, if you have a blog and your biggest struggles are brainstorming ideas on what to write about or keeping a consistent blogging schedule, know you have support in our team. Give us a call at 612-643-1824 or send us a message today to start reaping the rewards of business blogging.